Sometimes I feel a burden to be excited by all of this. At the end of a long ride, when my palms are sore and my back aches and my ears ring, when the sun is setting and our destination is still miles away and my headlight casts its pitiful beam into the darkness, I have to remind myself to be grateful. Grateful for all those things that probably don’t need mentioning because absent the little pains, they must seem obvious. The sunset on a Mexican highway, dusty old Horus puttering faithfully along, the romance, the adventure. But in all reality, it is the little pin pricks on your consciousness that often take center stage. The muscle aches, the numbness, the mechanical worries. After the little pains come the tedium of routine, which is shorter and sharper than in domestic life. 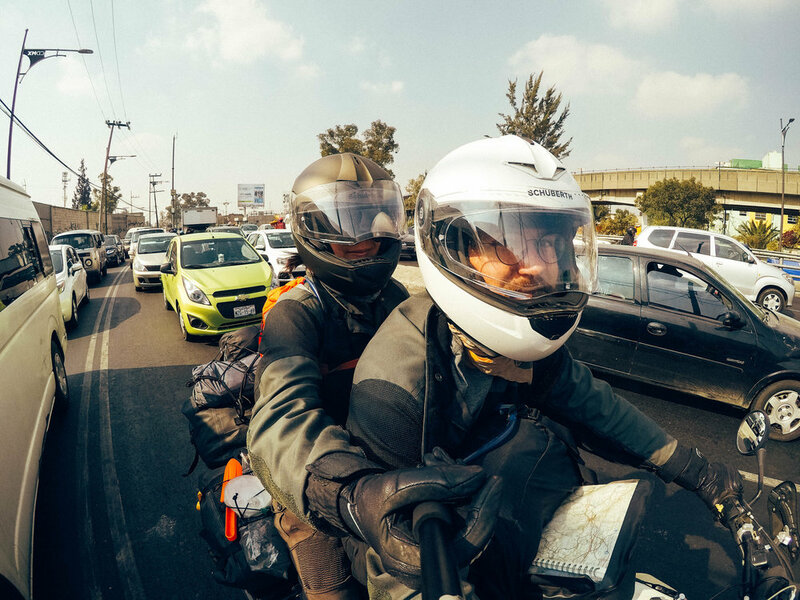 This includes: keeping all necessary devices charged, keeping our few pairs of underwear and socks clean (enough), keeping gas in the tank, air in the tires, and oil in the engine, the cycle of packing, unpacking, and packing again. Staying hydrated, finding lunch, finding a place to sleep. It is easy on the road, as in life, to allow this perpetual to-do list to take control. In so doing, burning the gas is the reason to fill the tank is the reason to burn the gas. This rote behavior, unfortunately, is not solved simply by a rapidly spinning odometer. Nor, unfortunately, by a menagerie of magnificent cathedral memories, nor by a taco-eating-marathon, nor by cobblestones, nor by sunsets, nor by beachside pagodas. When the trance of novelty fades, and it always does, I find myself, the same self I brought with me. I didn’t auction me off with the rest of my belongings, I didn’t leave me at the border. Here I am, gazing upon an ancient wonder of the world, asking myself, ‘do I even care about pyramids?’ Here I am, losing my temper over some little thing. Here I am, thinking and analyzing, when perhaps I should be singing and dancing. Do I even care about pyramids? I suspect that many, if not all, people experience similar feelings from time to time. But we live in a time of unbridled self-promotion where the boundary between self and self-image is blurry. I follow a lot of other adventurers on Instagram and it amazes me that no one seems to express anything but awe, excitement, and gratitude. It is possible that it is simply a Darwinian reward mechanism built into social media, wherein the most idealized become the most popular and therefore the most accessible. Reading all the effusiveness makes me grateful for old grouch Paul Theroux and his book ‘The Old Patagonia Express’. For all the misery I felt reading it, it left no doubt that he was genuine in his appraisal. He had not left behind in Boston his critical eye for a manufactured, glamorized version of his experience. He was not vying to live up to a fictional ‘everyone’s’ expectations and fantasies. He managed to complete his journey with his cynicism fully intact. Maybe he should have felt lucky and privileged and grateful to ride trains and write about it for money. But I’m glad he didn’t, because our fictional ‘everyone’ doesn’t need another #wanderlust #welivetoexplore dazzling them with the fallacy that just beyond the horizon a beautiful new self is waiting to be inhabited. It is a fine line that we walk when we travel, because of course there many marvelous things that we would be remiss to dismiss, and of course there are many things to be grateful for, and our psyches benefit from the practice. But the same could be said of daily life. If you can wake up and be grateful and find the marvelous things around you, you will no doubt benefit from it. Traveling and adventuring, no matter how much we want to believe it, no matter how much we invest in the image making and hashtagging, does not make life perfect. I think you understand that. I think most people understand that. But maybe you, like me, are susceptible to envy those people who always seem to be happy and enthusiastic, never grow weary or doubt, but always put their best face on. I’m happy to be your antidote. Here I am still learning, adjusting, griping, laughing, breathing, cursing. Meandering towards the horizon.